In 1892 Guthrie, Oklahoma was home to one of the very first Federal Prisons in the Midwest. Labeled the “Black Jail” by inmates. Bill Doolin was once a inmate, also the Dalton Gang. The Prison closed in the early 1900's. Nazarene Church occupied until 1970's,then the Samaritan Foundation until 1995. Officially closed in the late 1990’s after the Department of Human Services declared the structure to be unfit for the children that lived in the compound. The prison is suppose to be haunted by James Phillips. June 1907, Phillips was the first white man sentenced to be hanged at the prison. As he watch them build the gallows across the street he fell back on the bed and die. Coroners report stated "He die of fright" His ghost is said to walk the halls of the prison. 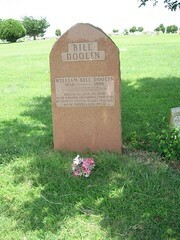 Outlaw Bill Doolin was once a inmate in the First Territorial Prison.